I’ve been pleased to see that suede has enjoyed something of a renaissance in recent years. Italians like Loro Piana have always done it well – often in a classic Italian mix of brown suede and grey cashmere – but others such as Berluti, Dunhill and Gieves & Hawkes have embraced it recently. I wrote a feature for the upcoming issue of The Rake on suede, which touched on these style points, as well as historical and technical ones. Starting with the last – good suede is normally the reverse of the skin, but it can be a split skin as well (where a thicker skin is split and kept the right way up). This tends to be weaker, as it doesn’t have the leather surface on the back. It’s one reason shoemakers might say they use ‘reverse calf’ rather than just suede. My favourite suede jacket is a dark-brown blouson I bought from Kilgour the first time Carlo was at the helm. 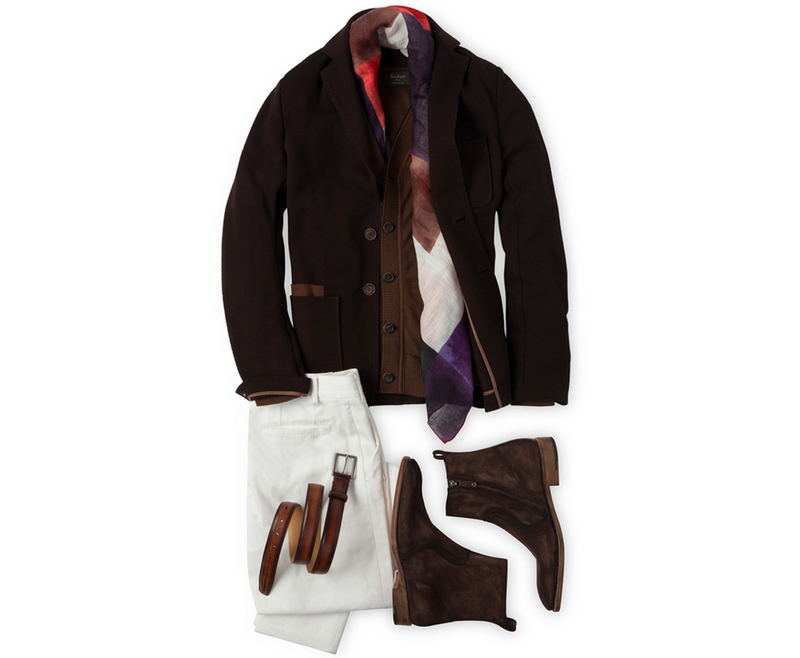 Simple and unlined, it is the perfect weekend jacket – with jeans, flannels or linen. 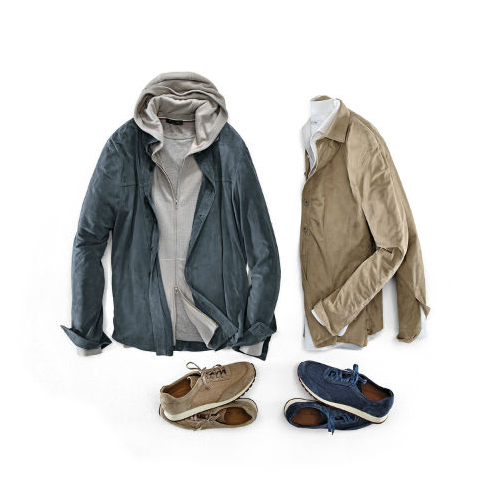 I also recommend the classic Louis W Ferris model from APC, the J Crew suede bombers, and anything from Loro Piana (some slimmer styles coming in this season, which is great to see). I am having a suede jacket made by Lorenzo Cifonelli at the moment. We’re hoping to have it ready for Autumn. Interestingly, the French tailors do more in suede than others, because they usually have leather workers in-house. Leather work requires special needles, not to say expertise, and when others use leather (as Gieves did for me) they have to use outworkers. Keep an eye out for the Rake piece. You can follow the discussion on The subtlety of a suede jacket by entering your email address in the box below. You will then receive an email every time a new comment is added. These will also contain a link to a page where you can stop the alerts, and remove all of your related data from the site. Nice one, Simon. I also like the Valstarino as the classic Italian RTW choice with a super soft hand. Yes, Valstar make a stunning jacket. Suede shoes? Belt? Gloves? Other accessories? Suede Jacket? A step too far for me! If gets dirty/ stained/ splits etc…the maintenance just seems too much of a hassle even for my fastidious self. I appreciate the aesthetic in others and commend Simon for this, but this is outside of my purview. Thanks – always worth asking in store how much these pieces are protected against the elements. Many are to some extent, usually with an enzyme treatment. It changes the feel of the material slightly, but it does mean less maintenance is required. Alcantara (synthetic suede) also handles this better. I certainly wouldn’t recommend wearing all those suede pieces together by the way! There’s a Seinfeld episode where Jerry buys a suede jacket that’s a constant reminder for me not to buy one. They’re very nice, but don’t feel like a London thing. Can you suggest me some european online shops with a good variety of trousers at affordable prices? In the range of 120-150€ for a pair of trousers. Howard yount and epaulet are nice, but americans. Isn’t Alcantara mainly used in car seats and the like? I unintentionally omited the annex ‘yes’ at the end of my list earlier; in the sense that i am a lover of suede (over two-thirds of my not insignificant shoe collection is suede) and own suede accessories but a suede jacket is above my station. My wardrobe is just not fully developed enough for it yet – maybe never! Anyhow, looking forward to your Cifonelli suede jacket (Is there anything they cannot make? 😉 ). Full of admiration! 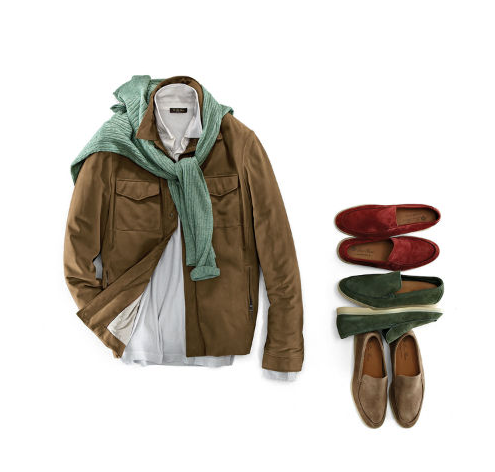 What are the considerations for wearing suede shoes with a suede jacket? Would “double suede” be a faux pas? The reason I ask is that outfits where you’d wear a suede jacket are often those where the natural shoe choice would be suede (as in some of the photos in this post). Do you still stand by the above comment. 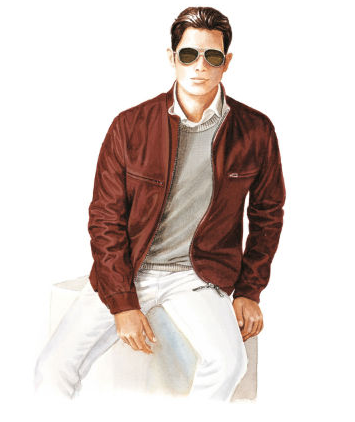 I’m thinking of buying from polo suede valstar jacket from drakes. However, my concern is that all my shoes are suede. Would chocolate suede chukka boots go with a polo suede jacket? People obsess too much about wearing suede shoes or jkts in the rain. It’s a natural material. It can handle a bit of water. It will change a little in colour and texture over time. Stop being so ridiculous! Suede jackets, as superficially desirable as they may be (they tend to rear their heads every ten years or so) have been the sartorial bane of my life. They are intemperate — it’s either too hot or too cold to wear one and they breath atrociously. Furthermore, by the end of week three, some ne’er-do-well has either brushed against it with a cigarette or droped a glass of red wine all over it. It will then take its position at the back of your wardrobe and your wife will constantly remind you of the fact that she advised you not to buy it. Suede shoes yes — jackets, my advice would be tread carefully because you probably won’t wear it. 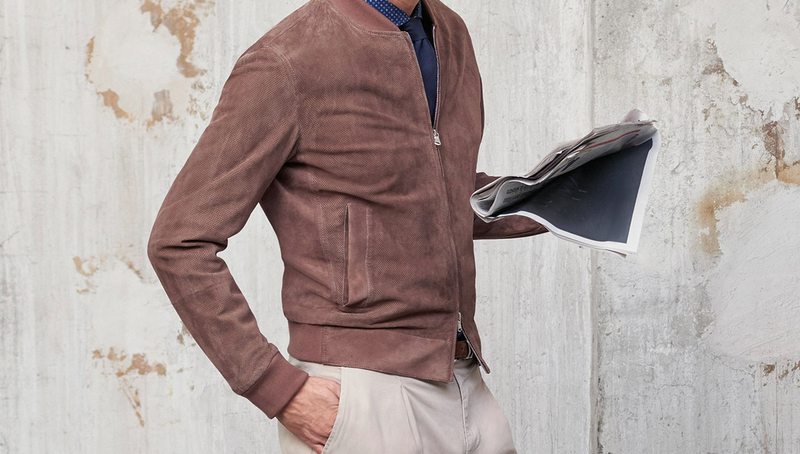 On the subject of Loro Piana, they do make a fabulous, versatile jacket called ‘The Traveller’. I own one and it’s one of the most useful pieces in my collection. Thanks David. I wear mine very regularly, but then I think I’m lucky enough to never have had someone brush a cigarette or spill red wine over anything I own. I have the Traveller jacket too, which is nice and very practical. Lovely article, as usual. Just like some of the previous commentators, me too, I am fond of the “Valstarino” jacket. I feel Valstar have a strong heritage, and they have been consistently making good quality suede jackets over the years. P.s., please, note that there is a typo error in one of the captions: it should read “Cucinelli” and not “Cucinneli”. Thanks, yes the Valstarino is a great style. Very versatile and a good balance between dressy and casual. Hi Simon, I enjoyed reading this article and now I am determined to resurrect my suede blouson from the back of the cloakroom. Even as I was scrolling down and didn’t yet see the caption under the first image, I knew it was from Loro Piana. Something extremely distinctive about that ensemble. Actually, it and all of the others featured in this article are absolutely beautiful. I see white trousers as somewhat ballsy – although I own some fitted white jeans for summer, I am yet to actually wear them. The suede blousons look beautiful however, and I’ll have to pick one up if I find one within budget. On a side note, I love that this blog has opened my eyes to suede over the years. My brown suede penny loafers remain one of my best buys in this category, and put a smile on my face every time I wear them.